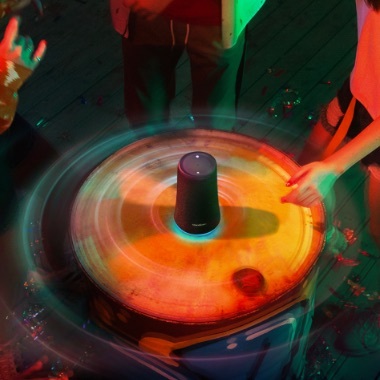 A revolutionary audio experience with intensified bass and a beat-driven light show. Flare drops powerful 360° sound through dual back-to-back drivers and thumping bass radiators. 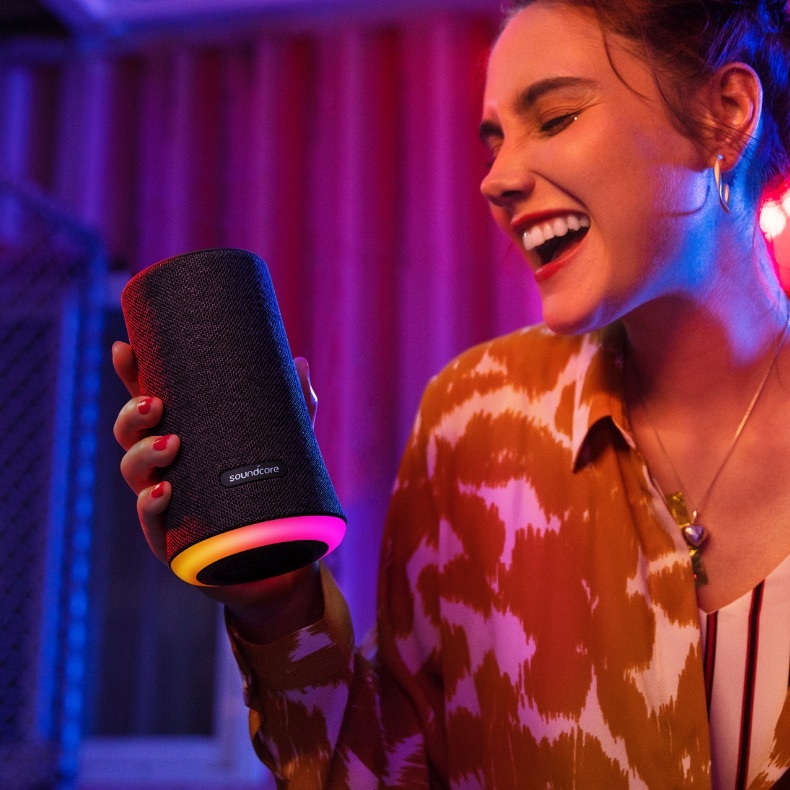 With seamless all-around sound, you get a fully immersive audio experience that electrifies every square-inch of any space. To produce an electric atmosphere Flare utilizes exclusive BassUp™ technology. A customized digital signal processor enhances your music's bass frequencies in real time before state-of-the-art neodymium drivers transform it into an audio explosion. Hip-hop beats need big bass and classical compositions need crystal treble. Every type of music sounds at its best with a specialized sound profile. The Soundcore app not only tunes the EQ perfectly for any genre, it completely customizes the sound for you personally. Watch a halo of LEDs phase, pulse, and shine with the rhythm of your music for a completely immersive audiovisual experience. 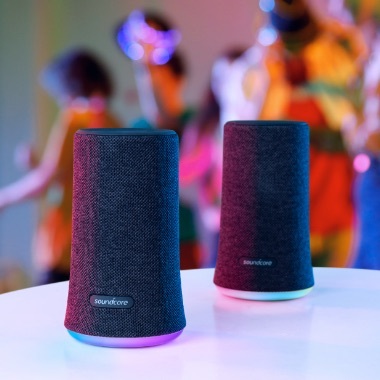 5 color themes create the ambience for the occasion, then 5 adjustable illumination patterns give you the freedom to choose the perfect light show to suit your music, and most importantly, your mood. 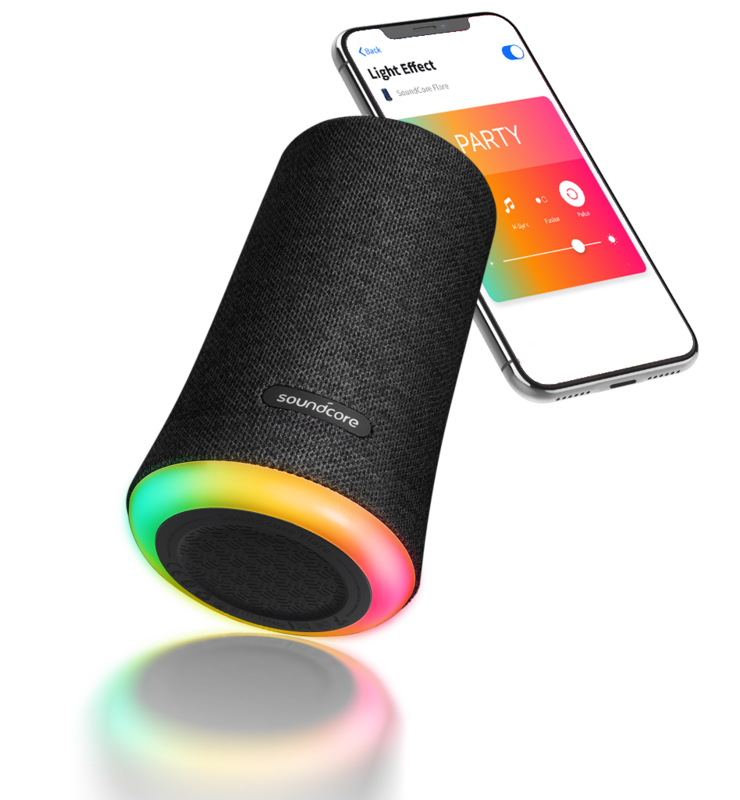 Flare is the first speaker to utilize the all-new Soundcore app; simple-but-powerful software that allows complete customization of any Soundcore device. Adjust sound profiles, lighting, and more with the tap of a finger. For extra intensity, double the Flare and pair 2 speakers simultaneously. Sound and light synchronizes seamlessly across both speakers for a multi-dimensional experience that takes you even higher. Turn up the volume, spin up the lights, and prepare to get wet. 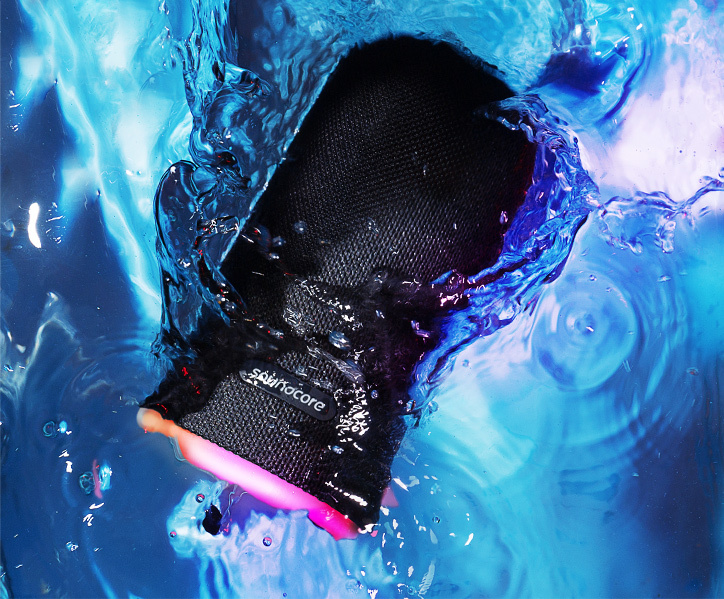 Flare’s impermeable IPX7 casing effortlessly withstands spills, rain, and even complete submersion in water. 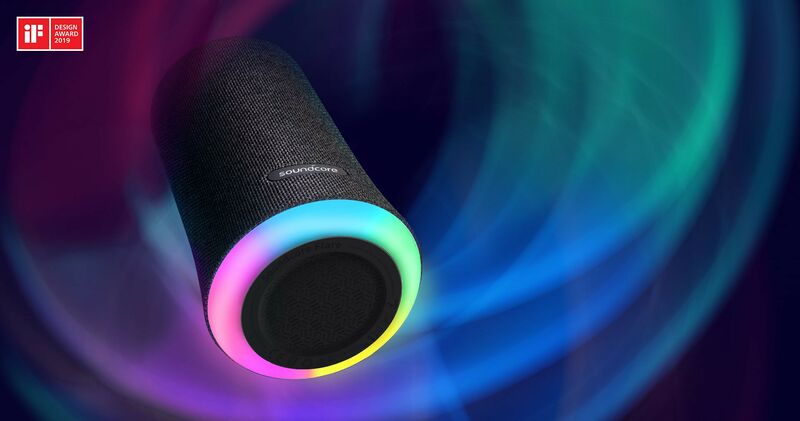 Give your party a serious splash of sound and color. Just because the sun goes down doesn’t mean it needs to get dark. 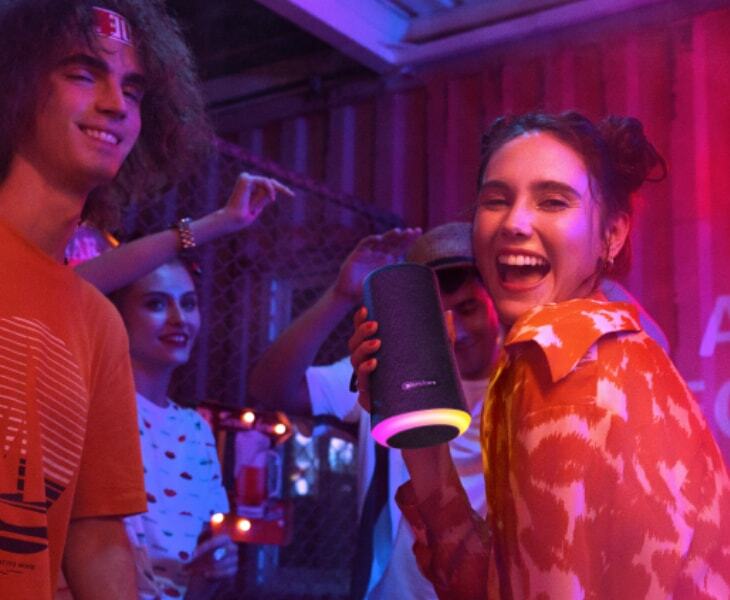 Keep the night glowing with over 12 hours of brighter sound and even louder lighting. Why can't the speaker connect to my device? a. Check to ensure your device's Bluetooth setting is enabled. b. Make sure your device is within 3ft of the speaker. c. Delete the pairing record on the speaker and your device then try to re-pair. You may need to change the default audio output on your PC to "Bluetooth speaker". Yes it is possible but only after disabling the original device's Bluetooth or deleting its pairing record before pairing the new device. Can Bluetooth and the AUX input play simultaneously? When trying to connect, why is my PC asking for a pin number? No pin should be required. Restart your computer and try to re-pair. Is it possible to pair two speakers with one device? Yes. Two of the same speaker can be paired via a single device. How long will the speaker take to fully charge? It will take around 3.5 hrs at 5V/2A for a full charge. How long is the playtime after a full charge? Playtime varies according to volume level and audio content, at 60% volume, playtime is around 12 hours. Why won’t the speaker recharge? Double check your cable and charger with another device. If the speaker has remained discharged a long time it may take a while to show it is recharging. Can I use the speaker to play music while it is being recharged? Will the speaker automatically turn off? It will automatically turn off after 30 minutes when no connection. But it won’t turn off when being charged.